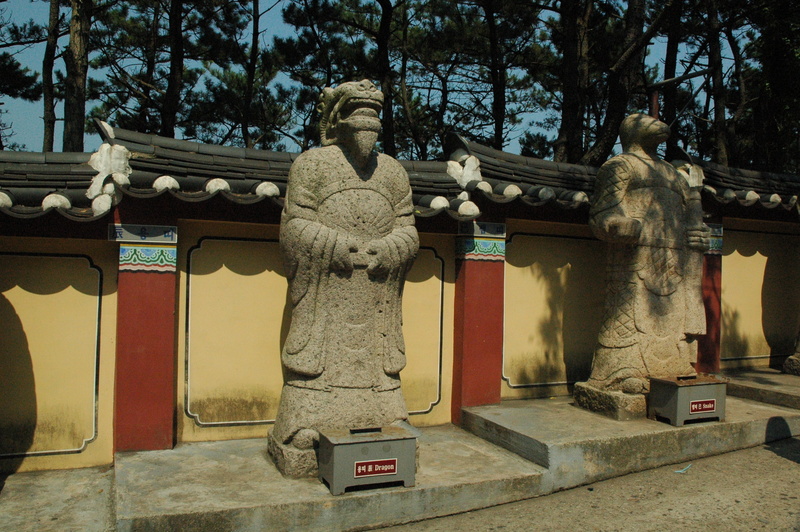 Built in 1376 during the Goryeo Dynasty by the monk Naong, this temple is one of three dedicated to the Goddess Buddha of Korea. 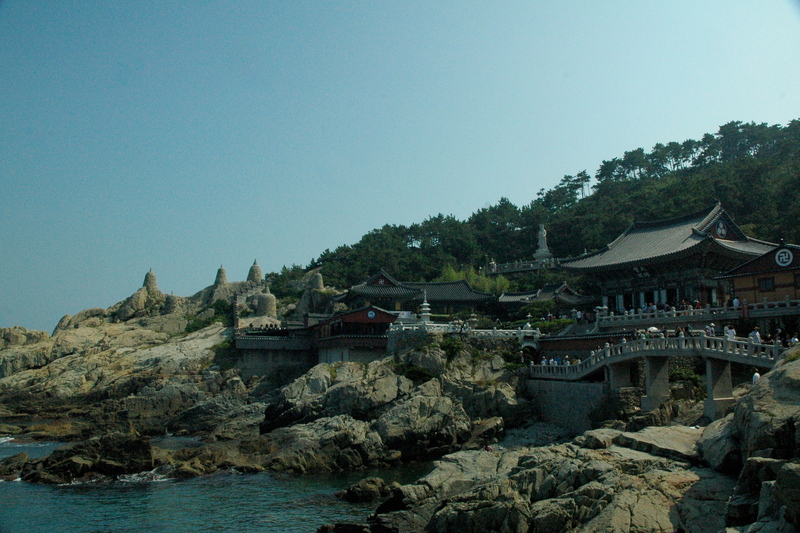 Although most temples are found in the mountains, the Haedong Yonggungsa Temple is located by the sea in Busan. The temple, destroyed by fire during Japanese invasion in 1592, was rebuilt in the 1930s. Although Brent and Monica have been to this temple before (I first became aware of it from their pictures), they joined me yesterday. 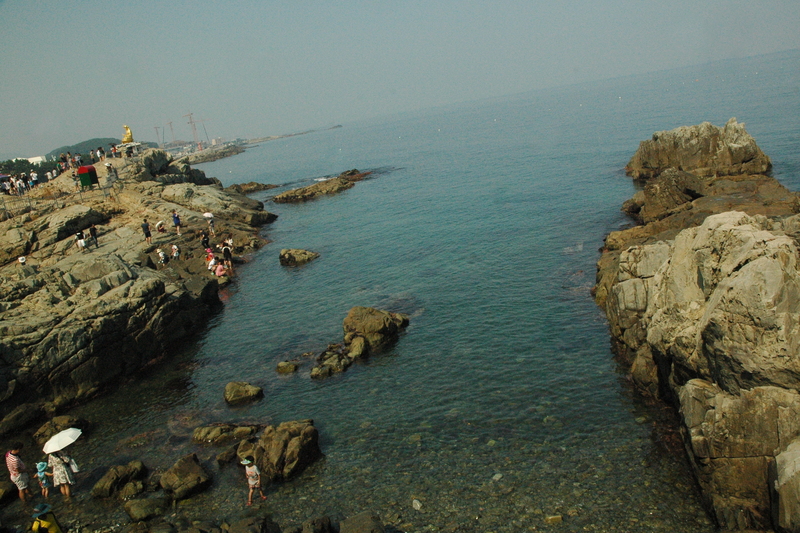 We took the green metro line to Haeundae then bus 7 to the last stop. Following a mass of people up a hill, we found ourselves walking down a row of street vendors selling various traditional foods and gifts. We were then greeted by statues representing the 12 zodiac animals. Born in 1988, I have the mightiest of all signs – the dragon. The Great Goddess Buddha of Mercy reincarnated unlimited love and mercy. As Bodhisattva Avalokiteśvara “lives alone at a solitary near the sea and appears on the back of a dragon”, this temple is in perfect harmony as it combines the sea, dragons, and the Great Goddess Buddha. Having lived in Europe for three years, I am wildly familiar with the inside of thousand-year-old churches (so pretentious). 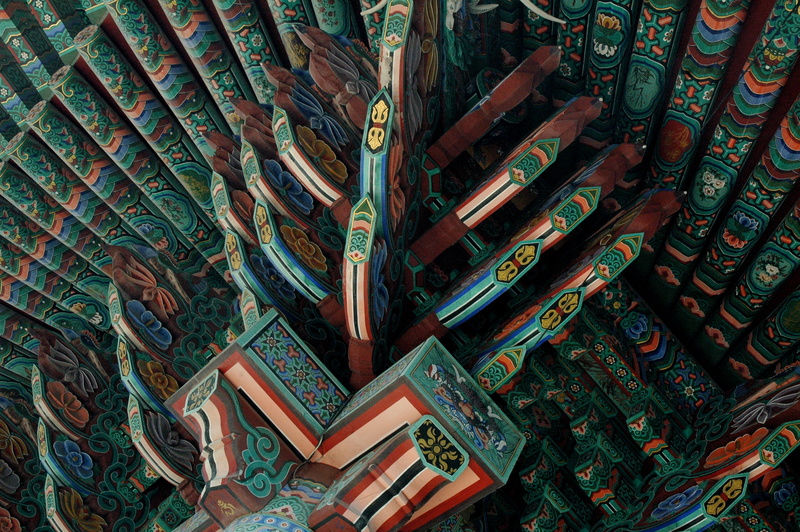 It was a welcome change to see a temple in all its artistic, colorful splendor. People of all ages came to the temple not only to appreciate the beauty and history, but also to pray. 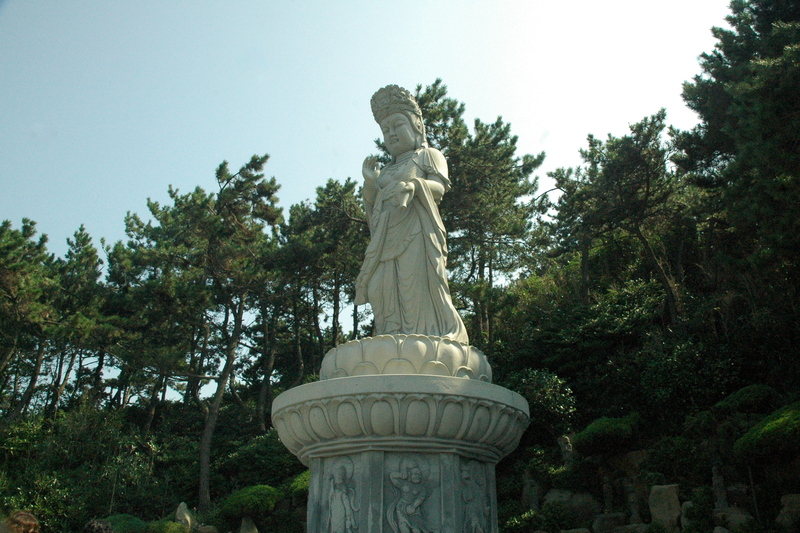 We saw a child as young as six bowing down to the Buddhist Goddess of Mercy statue. I know the four noble truths of Buddhism, but do not have the whole eight-fold path memorized. 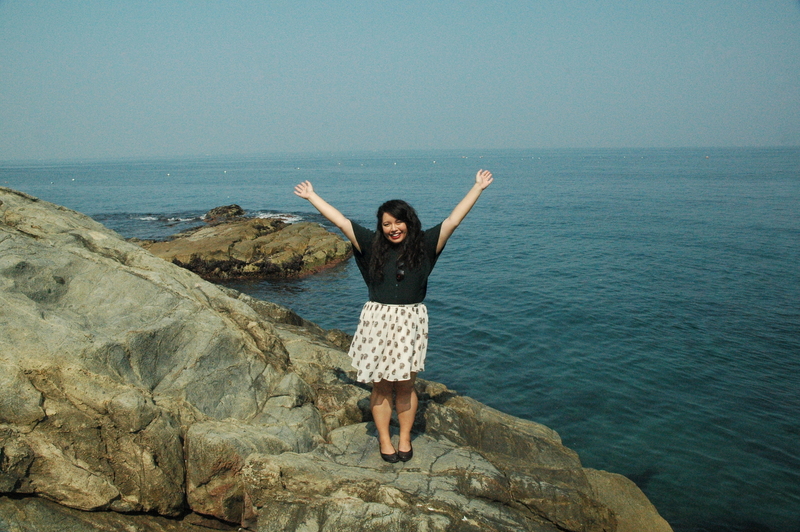 After walking around the temple, we climbed around the rocks by the sea. I was wearing shoes that do not like to stay on my feet and my right knee is basically out of commission (seriously, what is my life), so I struggled a little. Monica and Brent, on the other hand, frolicked around like mountain goats. I stared at them from a distance like the perpetual third wheel I am. The next thing on our list was to go thrift shopping in Nampo-dong. 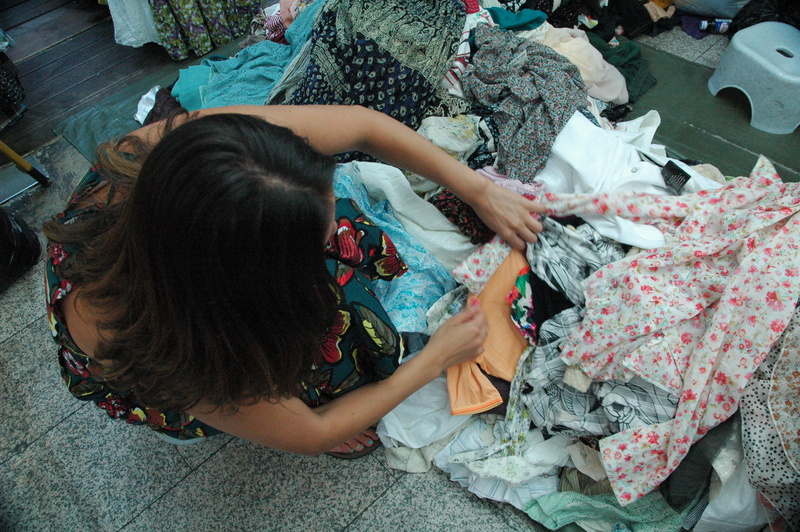 Monica and I ended up sitting on small stools in order to dig through a pile of ₩1000 ($0.85) clothes. We then entered one more store with loads of clothes for ₩3000 ($2.54) each and left with matching “T. 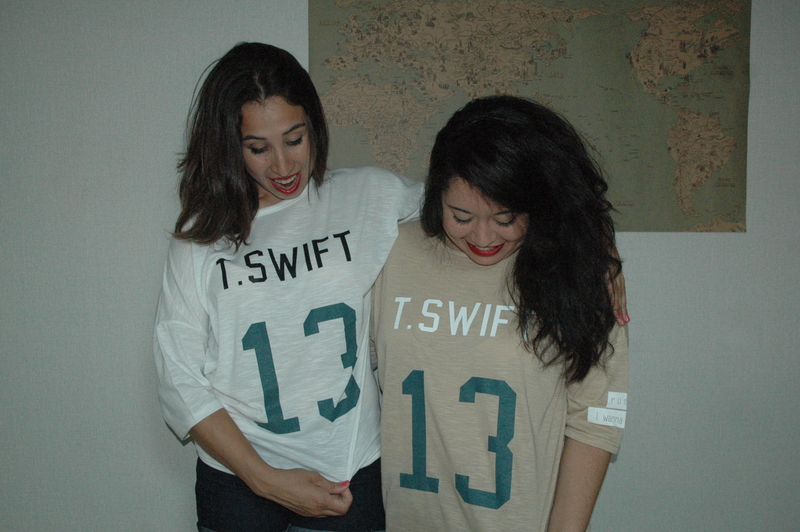 Swift 13” shirts. My favorite part about the shirts is that they have “r u mine? I wanna beours” on the sleeve. Modern day poetry. I am not a fan of Taylor, but these shirts… how could I say no? Famished and tired from walking around all day, Monica, Brent, and I saw a spinning pig and ran inside. 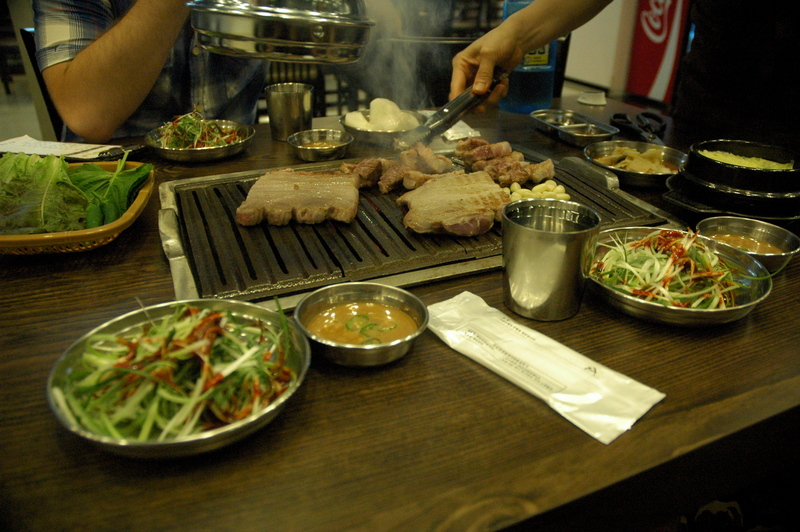 It was time for Korean barbeque (samgyeopsal / 삼겹살). Upon entering the restaurant we were greeted with actual cheers. Celebrities. I am decent with chopsticks, but I definitely need to up my game. After filling our bellies, Monica and I went to a photobooth place to take cute photos to over-edit for fun. As it was our first time and everything was in Korean and Japanese, our photobooth experience ended up being hilariously tragic. Needless to say, we plan on redeeming ourselves on Tuesday. The three of us just got home from a multi-bang (a room to karaoke, play video games and board games, and watch dvds) and it was awesome. We played Super Smash Bros. Brawl, Mario Kart Wii, and Just Dance. With only five minutes to spare, we screamed out short clips of “Wrecking Ball” by Miley Cyrus and “Mamacita (아야야)” by Super Junior. I expect to get scouted by an entertainment agency any second now. 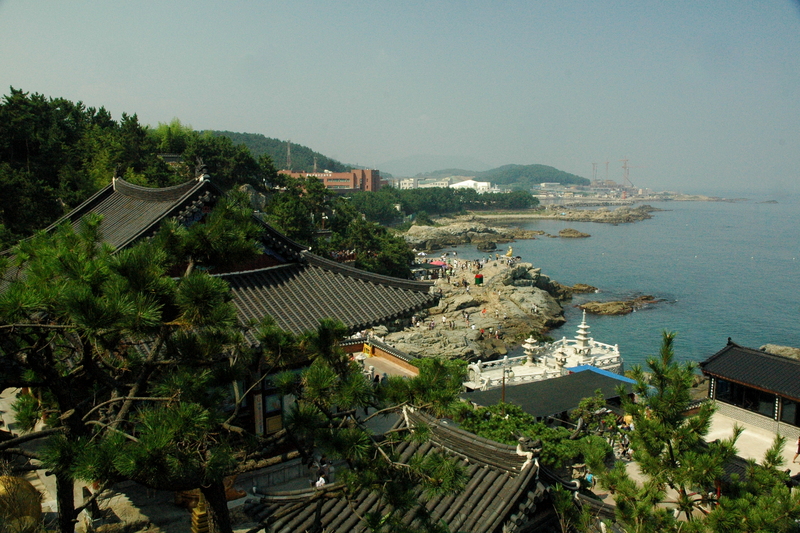 Nice post on Haedong Yunggungsa Temple btw. Some good infor and photos. There is a great Jja jangmyeon and Jjampong restaurant just down the road from this temple as well.